Under normal circumstances, I would simply entitle this image “Entrance to the Subway”. However, the circumstances surrounding my hike into the Subway were anything but normal. Indeed, September 19, 2012 is a day that I will never forget, and for all the wrong reasons. 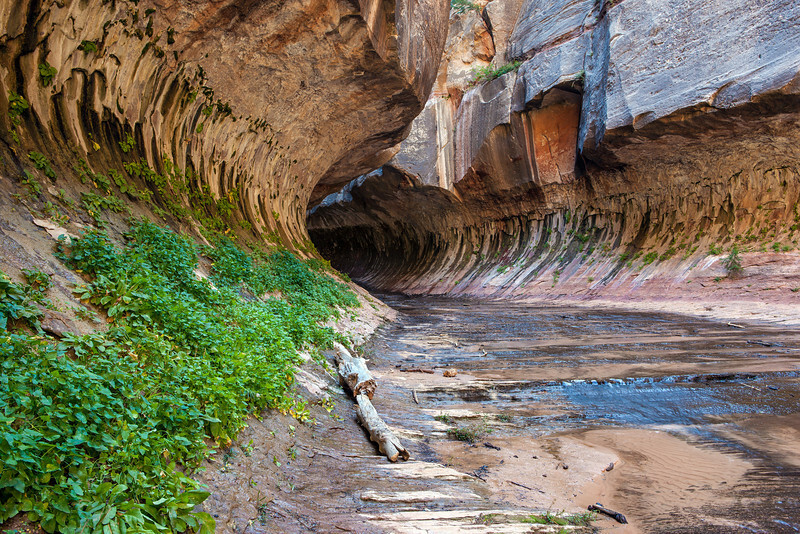 The Subway lies in a remote and rugged area of Zion National Park. It is a stunningly beautiful area of geologic anomalies and breathtaking color. The hike to the Subway is a star-studded affair, featuring sheer cliffs, rivers, tunnels, pools, waterfalls and caves, just to name a few. The place is simply amazing, and irresistible to photographers and hikers alike. Because of the Subway’s allure, the NPS (National Park Service) has established a quota system for the area. Only 20 people per day are allowed in. The Subway was only the first of many destinations on my itinerary as I embarked upon a two-week photography trip to the Colorado Plateau. On Tuesday, September 18, I arrived in the small town of Springdale, Utah after driving 450 miles from my home in southern California. This would be my base camp for the next few days. On Wednesday I arose well before sunrise, excited about the new adventure that lay before me. I drove for about 30 minutes to the remote trailhead known as Left Fork. I arrived just after sunrise and prepped my heavy backpack for the long hike ahead. An explanation of Subway logistics is in order here. The Subway is so named because it looks just like the round tunnels you would find underneath New York City. It is only about ¼ mile long, and lies in the exact middle of a 9-mile long canyon. There is a trailhead at each end of the canyon. At the northern end of the canyon is the Wildcat trailhead, and at the southern end is the Left Fork trailhead. The Subway can be reached from either end. Either way, it is a 4-1/2 mile hike to the Subway, and then another 4-1/2 miles back out. The route I chose began at the Left Fork trailhead. The route involves a lot of river wading, but nothing more than waste deep this time of year. The downside to my route is that it is physically a tough hike. It begins with a very steep 800-foot descent down a slippery talus slope. Then it is boulder-hopping and bushwhacking for the remaining 4 miles to the Subway. Many times it is easiest to simply hike straight up the middle of the river. I was the first person at the trailhead, and I began my hike at 7:45. After 20 minutes of mostly level hiking, I reached the edge of a cliff and stared down to the canyon floor 800 feet below. I then saw the trail descending into the canyon, and immediately my fear of heights began to rise up within me. Half way into the descent, both feet slipped out from under me and I fell – hard. Man did it hurt. I slid for a few terrifying seconds before I stopped mere feet from a drop off. It was at this point that I realized that this hike was going to be far more difficult than I had anticipated. After I had calmed down a few minutes later, I gathered myself and continued the treacherous downhill hike. I reached the canyon floor and the river about 8:30, relieved but sore. My left hip was in a lot of pain. About 10 minutes later a German hiker passed me on the trail. He had apparently left a few minutes after me. We briefly spoke in English as his English was better than my German, although not by much. He then took off in front of me. I envied his agility, as all that he was carrying was a camera around his neck and some water in a camelback. He was able to boulder hop and hike upriver with ease. My heavy pack made everything so much harder. I told myself that it would all be worth it once I started shooting. About a half hour later I saw the German hiker coming back towards me. This was strange. No way could he have reached the Subway – it was still miles and hours ahead. At the same time I noticed a woman whom I had not seen before. She was following him about 10 yards behind. I asked him why he had turned around. In his broken English all that he could mutter to me was the word “tragedy”. I then looked at the woman and saw that she was quite distraught. Her appearance was disheveled, and the look in her eyes was one of anguish. Between sobs she told me that she thought her husband was dead, and that he had been hanging upside down in the Subway since 5:30 pm the previous day (Tuesday). This means that he had been hanging for over 15 hours. I asked her his name, and she said “Yosh”. I immediately grabbed her hand and began praying with her. I prayed for Yosh and her both. The German fellow stood aside awkwardly, not comfortable conversing in the English language, or perhaps not comfortable with prayer. I got all of the pertinent information that I could from her. Apparently she and Yosh had attempted the third and final rappel into the Subway when something went terribly wrong. She had descended first without incident, but Yosh had the rope jam in his carabiner somehow. To make things worse, they had chosen the wrong descent route, coming down straight into a waterfall instead of a dry and much safer descent 50 feet further down the Subway. They had left from the northern Wildcat trailhead and were the last group of the day, so no help was coming behind them. She had attempted to free Yosh, but could not. She said that he was hanging several feet off of the ground, upside down in a waterfall. The whole upside down thing was freaking me out. She had also tried to hike out of the canyon for help, but became disoriented. Eventually darkness forced her to turn back and spend the night with Yosh. She tried again to hike out this morning (now Wednesday, the 19th), and she finally ran into the German fellow, and then me. The German hiker immediately abandoned his dream hike into the Subway, and was escorting the poor lady back to the trailhead to summon help. God bless that man from Germany. He gave up something that he had flown all the way from Europe to do in order to help a person in distress. I hope that he got another permit and was able to return the same trip. After getting detailed information from Yosh’ wife (I didn't get her name at the time), I headed towards the Subway, horrified at what I had just heard. I still had about 3 hours of very hard hiking ahead, and I was already hobbled due to the nasty fall I had just taken. I was so glad that the lady was in good hands with the German, but for the next 3 hours all that I could think about was what lay ahead. Her story seemed too incredible to be true. Hanging upside down, in a waterfall, in a dark cave? Come on, this stuff happens on TV, not photography trips. And certainly not to me. At 11:45 I finally reached the entrance to the Subway. The picture on the previous page shows the entrance (I actually shot it on the way out – a couple of hours later). I entered the tunnel from which the Subway gets its name. It got darker and darker as I went further in. In the distance I could hear the faint sound of a subterranean waterfall. According to the woman, this is where Yosh was hanging. The footing was treacherous, and visibility was getting quite poor. Hollywood could not have scripted a more eerie scenario. I was just plain scared, and did not know what to expect. My imagination was running wild in that dark and lonely cave. About 50 yards in I encountered a waste deep pool of ice cold water. The sound of the waterfall was quite loud now, but I still could not see it. I took off my backpack and entered the pool, wading through it for about 20 feet. I came up out of the pool and rounded a corner. I could now partially see the 20’ waterfall in front of me. Lying on the ground next to the falls was a small backpack, strangely unattended. The end of a climber’s blue rope lay next to it. Following the rope, I slowly continued around the corner. My heart was beating so hard that I felt as though it would leap out of my chest at any moment. I always hike alone, but this is one time I sorely wished for a companion. Finally I could see the waterfall in its entirety. In the middle of the falls was a large, dark object. This had to be a dream. Surely I would wake up from this at any moment as I had from every other nightmare in my life. Not this time. As my eyes adjusted to the darkness, I could clearly see a body hanging upside down from a cliff. The man was dressed in a full-length sleeveless wetsuit. He had on gloves and a light blue helmet. His motionless arms hung about 5 feet off of the ground. The blue climbing rope and a red harness was wrapped around his right ankle, which was bent at a severe angle, indicating an obvious fracture. Yosh was blue and had no pulse. He was cold to the touch. Water was pouring on to his face. My worst fears, and in particular those of Yosh’s wife, had been realized. Yosh was dead. My thoughts immediately returned to Yosh’s precious wife. I thought about her plight. This had happened at 5:30 the previous afternoon. The couple was alone in the deepest recesses of a cold, dark cave, and what little ambient light there was would have totally disappeared by 7:00 pm deep in the canyon. Remember, not only were they in a cave, but the cave lied at the bottom of a very deep gorge. They were over 4 rugged miles away from either trailhead, and there was no cell phone coverage. The area is so remote that even the trailheads don't have cell phone coverage. No more hikers were coming their way since they were the last party of the day, and they knew this. Yosh did not have the strength to do a Herculean sit-up to cut the rope around his right ankle. I could see where he had taken a knife and cut his red climbing harness off of his torso. Yosh had the right idea. Indeed, his body had slipped through the harness, surely freeing him from an icewater grave. Tragically, the harness tangled around his right ankle. Only super-human strength could save him now. He would have to do a dead-weight sit-up while hanging upside down by his right foot in the middle of a waterfall. He would somehow need to maintain that impossible position long enough to cut through the very thick climbing rope with his knife. He didn’t make it. This must have gone on for a long time. All the while his wife is standing by helplessly, exchanging ideas with her husband about what to do. I later found out from various news reports that Yosh was a retired Neurosurgeon. This means that he would have been keenly aware of everything that was happening to his body as he hung upside down on that cliff. He would have known that his time was limited, and that his wife would soon be alone if he could not free himself. This was a horrible way to die. And his wife had spent the entire night with him. He had probably lost consciousness shortly after nightfall, and died not long afterwards. This left his wife utterly alone. Undoubtedly this was a night of pure hell for her. After I was certain that I could do nothing for Yosh, I left the cave knowing that a search and rescue team was surely on its way. The German and Yosh’s wife would have reached the trailhead hours ago and gone for help. I resumed my photography, although it would be safe to say that I wasn’t exactly on my “A game”. I deliberately and completely immersed myself in the photographic process, welcoming the diversion that it provided. The image on the previous page shows the entrance to the Subway after hiking 4-1/2 miles up Left Fork Canyon. It’s hard to imagine that just 50 yards inside the cave, a man’s lifeless body is hanging upside down in the middle of a beautiful waterfall. I met the first search and rescue team about 2 hours later. On my long hike out I encountered 3 different teams comprising 8 members total. One team of 4 was carrying a folded aluminum stretcher. I thought to myself that it would be impossible for them to carry Yosh’ body up the cliff that I had fallen on. That cliff is way too steep and slippery. Turns out I was right. They were unable to get him up the cliff, so they had to airlift him out of the canyon via helicopter the following day, Thursday, September 20. I have searched the internet trying to find out what information I could about Yosh and his wife. Yoshio Hosobuchi was a retired neurosurgeon from Novato, California. He and his wife Dresden had been spending their recent years knocking items off of their “bucket list”. Last year they had successfully climbed Mt. Kilamanjaro in Africa, which is no small feat. This year they had turned their sights on the Subway. They have 3 children. Despite having read almost a dozen online news stories about the tragedy, I still don’t know the names of the children. I so wish that I could have done more for that precious couple. I am glad that I got to pray with Dresden. Nonetheless, her husband and companion in life is dead. I don’t know if Yosh died from simply hanging upside down, or drowning. What I do know is that September 19, 2012 is a day I will never forget. I recently found out that Dresden tragically died in March of 2013 "from an accident" in her home. This was only 6 months after she lost Yosh. It makes me wonder if Dresden simply lost the will to live after losing her long-time companion. I can certainly relate. God bless you Dresden. I'm so very sorry that I could not have done more for you.